1. Navigate to the booking or order’s details page. 2. Add a negative transaction for the amount to be refunded. Select gateways support refunds. If your gateway supports refunds, you can refund the amount through Rezgo directly. 2. Ensure credit card is selected as the payment method. 3. 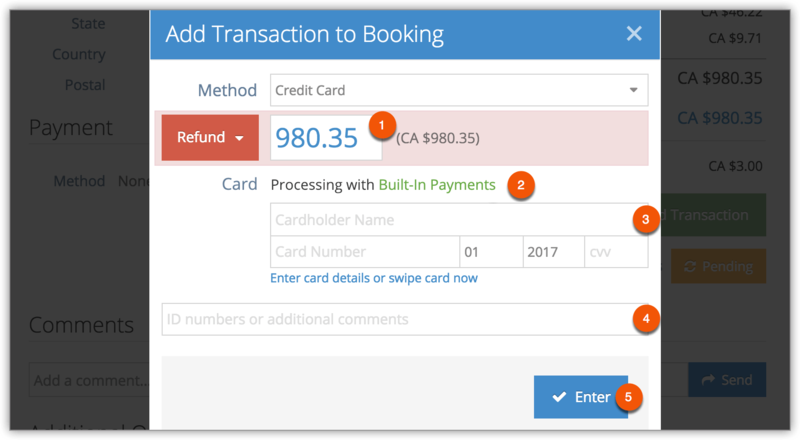 Ensure Refund is selected as the transaction type. 4. Enter the amount to be refunded (1). 5. Check the gateway being used to process the refund (2). 6. Enter the credit card’s details or swipe the customer’s card (3). 7. Enter any additional information or comments (4). If your payment does not support refunds, add a negative transaction, but DO NOT process the transaction through your gateway. If you do, the customer will be double charged.